In 1981, American theoretical physicist and cosmologist, Alan Harvey Guth proposed the “Inflation Theory” which is “the idea that the nascent universe passed through a phase of exponential expansion that was driven by a positive vacuum energy density (negative vacuum pressure).” The theory was invented in order to solve problems (flatness and the horizon) that were conflicting with real-time observations pertaining to the big bang theory. About 31 years later as the premiere dominant paradigm trying to keep the big bang theory intact, it has been an enormous failure! One of which has scientists back to square one. “This is not good news for our hopes for cosmic enlightenment. In a single universe, an underlying theory of physics might offer a prediction for how flat the universe should be, say, or for the value of dark energy, the mysterious entity that seems to be driving an accelerated expansion of the universe. Astronomers could then go out and test that prediction against observations. That’s not possible in an infinite multiverse: there are no definite predictions, only probabilities. Every conceivable value of dark energy or anything else will exist an infinite number of times among the infinite number of universes, and any universal theory of physics valid throughout the multiverse must reproduce all those values. That makes the odds of observing any particular value infinity divided by infinity: a nonsense that mathematicians call “undefined”. Interesting enough, the article points out that the “inflation theory” was predicting things that were useless or not wanted. Tegmark suggests that the theory has finally died. Is that true? Those of you who believe in this theory, has it in fact died? Instead of rescuing the big bang, it created more problems than it solved which is increasing complexity within its explanation due to falsifications and that is not a good sign for something being factual. So what happens? They retreated to other irrationalities, like brane theory or the no-boundary proposal. The brane theory requires a lot more fine tuning in the Universe than what we see. And another thing, it doesn’t matter if one can punch in equations all over the computer. If the inputs to a “proposal” are bogus, no amount of mathematical manipulation can rescue it! Perhaps not a time out, but rather a much better framework! Let’s start with, Cosmology. It’s been alluded to in comments in this blog (here) after making a point about the Hubble discovering them back in 1995, more mature galaxies would be discovered. Confirmation has been accommodating! The most recent setback for galaxy formation theories was discovered using gravitational lensing. Make note of this, there are more mature galaxies or stars deeper in space that have yet to be discovered! Has maturity in the vast deep regions in space been the only thing complicating on what evolutionary scientists believe in galaxy formation? No! It’s also happening in biology. “These fossils illuminate a key moment in the history of evolution when life made the leap from tiny, simple bacterial (prokaryote) cells towards larger, more complex (eukaryotic) cells which would make photosynthesis and sexual reproduction possible. The findings are reported in the journal Nature. Even with the evolutionary assumptions on dating, the data is not giving evolutionary scientists what they want. a belief in a slow process containing gradual increases in complexity appearing over time is being eroded all the time with the advancement of science. It wouldn’t be surprising to see secular scientists embracing a shift in the speed of evolution to warp speed or even instant evolution. So these ‘theories’ are not explaining nature or the universe but rather the data is explaining the ‘theories’ themselves. New discoveries hasn’t been complicating creationism rather it has been making its case even stronger! Nothing makes sense in light of evolution. In 1995, Hubble revealed one of the most amazing sights in one of the deepest regions of space than was previously unknown to man. These galaxies are way too mature for big bang models that predict a chronological order of structure concerning different stages of galaxies development as one looks deeper into space. 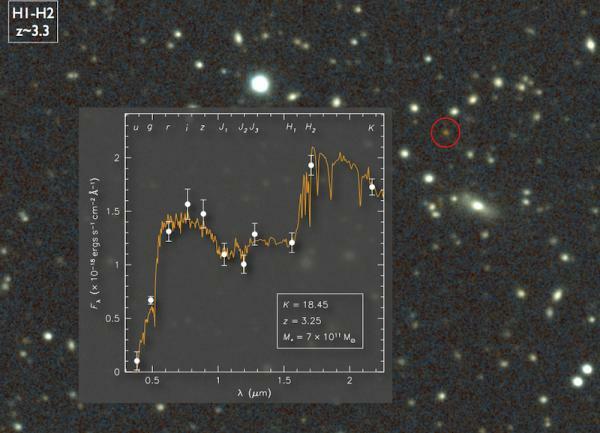 A new discovery has revealed even more mature galaxies found in very deep space. Indeed, these mature galaxies being observed today are falsifying big bang models. This might make multi-universes more popular, but the big bang theory holds no creditable scientific value. Where is the light and where is the sense? Could this mean a shift into more anti-realism by trying to explain this with multi-universes? These are not the type of surprises that should be found for a theory that is believed to be correct. Other observational problems have existed for awhile with the big bang such as “Population III” which are supposed to be the first stars ever created but it has never been observed and secular scientists seek only to discover one to claim verification of the theory when they need to find several of these types of stars to validate a prediction which comes from the big bang theory. Could scientists discover even more mature galaxies in very deep space? Yes, which would be awesome! So we find no organized structure of development predicted by the big bang, we find massive galaxies that are way too mature, no “Population III” stars have been observed but many would be required to validate and detecting radiation that is too smooth. The theory is dead, the only ones who think keeping it alive are going by blind faith. Observations are indicating a designed universe that is young, not billions of years old! There are important aspects that vjtorley from UC overlooks when he critiques YECs on the age of the Universe and the big band theory which he most likely believes that intelligent agents were behind it. If one is going to “advocate uniformitarianism” in trying to find evidence on how old the universe is, it’s going to create some problems. Better data has shown that background radiation temperature is almost uniform, to one part in 100,000, at about 2.725 K even when one looks in the opposite direction. The big bang theory predicts enormous different temperatures. In order for the temperature to even out as it appears now would require more time than the evolutionary time frame would allow which is what modern intelligent design proponents go by. Wouldn’t you say, one would have to invoke pretty “far-out” models in the fields of astronomy, and physics in order to explain the unified temperature in the universe? In order to speed things up, cosmologists came up with the idea of “inflation” which has it’s own observational problems. Some others who support the big bang have come up with another explanation which says, the speed of light was much faster in the past than it is now. This was actually proposed by creation scientists years before. In fact, creationist cosmology has been exploring two major proposals, one has to do with astronomical observations and Einstein’s General Relativity equations. You can read, Starlight, Time and the New Physics by John Hartnett for more information about it. Below is one of his lectures on the big bang theory and it’s quite interesting. The second proposal which was critiqued in UD, was developed by Dr. Russell Humphreys. His model is also based on general relativity, and explains things like, time dilation, and recent observations showing that suggests we live in a galacto-centric universe. More information is found in his book, Starlight and Time. vjtorley rests his faith in uniformitarianism in other areas of science and certain dating methods as well, like geology but even there has it’s problems even with the fossil record, abrupt appearances of complex animals with no intermediates before or after. Since many in the modern intelligent design movement advocate, common descent, this is a problem for them as well. And even if you believe those things like vjtorley does, what law of nature dictates how fast it can operate (like forming complex variants) and for how long? If he believes in intelligent agents, don’t you think the information comes by a lot quicker than choosing random mutations? The age is not limited to starlight, comets are often assumed to be billions of years old by those who believe in the evolutionary framework on age, until lately, when comets like Hartley 2 which was observed only 507 miles alway. Scientists calculated lost of material, and estimated that the comet will last no longer than 700 years. 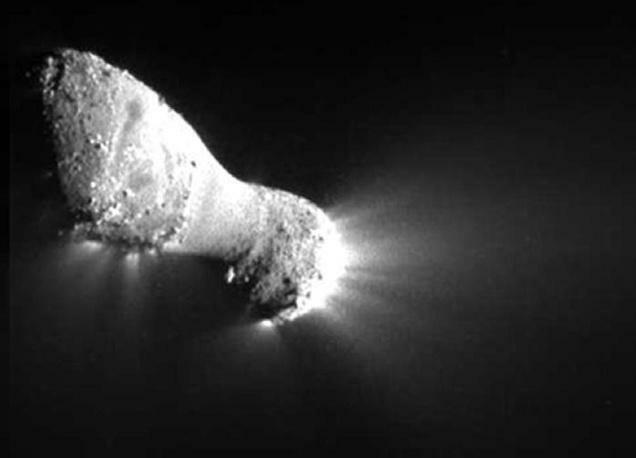 Rapid loss of material is common with comets. So with this better data, not even evolutionary scientists could fit this one into it’s billions of years time frame. So an Oort Cloud was invented to explain why comets like Harley 2 are only hundreds, perhaps thousands of years old. However, this tends to be one of those “far-out” models because there is no observational data to confirm an Oort Cloud even exists let alone being able to create new comets as older ones burn out. Understanding how starlight works and the age of the universe is an interesting topic, creationists nor evolution or intelligent design proponents know all the answers, it’s a learning process. But one thing is for certain, evidence does point to a young universe which has been and will continue to be addressed!